Known for their more popular lines using very dark wrappers, in 2015 Drew Estate introduced the Undercrown Shade. A much different lighter blend and style than the Undercrown Maduro’s inside and out. 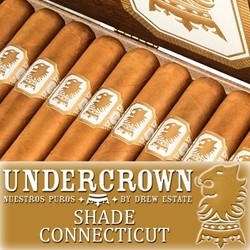 The Undercrown Shade hand-rolled premium cigars uses a lighter bodied Ecuadorian Connecticut Shade wrapper leaf bundled around a Sumatran binder with Dominican Criollo, Nicaragua Criollo and Corojo fillers. The final blend of these premium cigars is a medium-bodied, full flavored smoke that is lush and smooth. Smokers Discounts offers you a great way to sit back and relax with these Undercrown premium cigars. Try one of the varieties of sizes and flavors listed below. Each of these styles are available today for a discount price! Call us for more details!